Thandai is an Indian Cold drink which is usually served on special occasions as well as festivals. 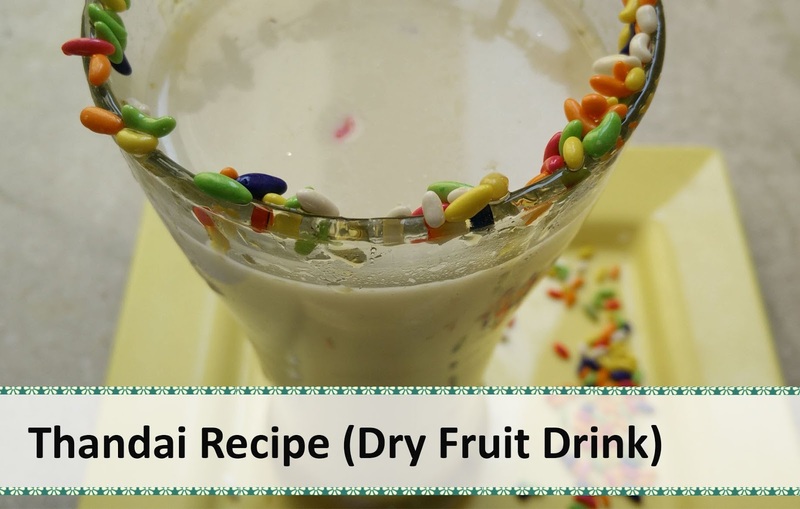 It is a very healthy drink and can be considered as a power drink as it is made up of almonds and other dry fruits. 1. In a blender jar, grind all ingredients except milk and sugar to make a paste using little water. 2. Sieve the paste (using Muslin cloth or sieve) by adding water to the paste. Sieve the paste completely till we get a dried leftover and a concentrate. 3. To the above concentrate, add cold milk and sugar. Add ice cubes if required. 4. For garnishing – Take a tall glass and apply honey on the rim of the glass. Put the glass upside down in colourful fennel seeds, till the seeds get stuck to the rim. 5. 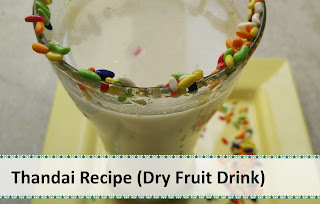 Pour the Thandai in the glass and serve cold.